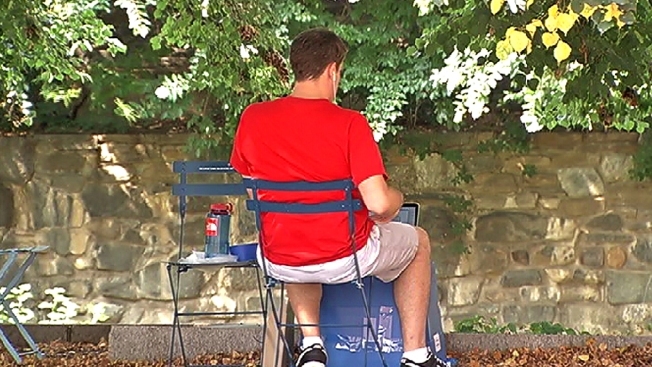 The new lawn chairs set up around Georgetown have attracted families with young kids, cyclists on the C&O Canal towpath and laptop-toping office workers seeking some sun. But they've also attracted the attention of thieves. "I have to admit that we've lost some [chairs] to theft, and we're trying to decide how to manage them... so they're less susceptible to being stolen," said Joe Sternlieb, CEO of the Georgetown Business Improvement District. About a month ago, the group bought 50 of the metal chairs at $100 each. Similar to styles seen in Europe and in Bryant Park in Manhattan, the chairs debuted recently along the canal and in other spots around Georgetown to provide more spaces for people to linger, and to keep Georgetown an attractive destination even as other neighborhoods -- such as H Street Northeast, Capitol Hill and Southwest -- grow in popularity. Sternlieb said that in surveys, many people indicated they'd like more places to relax for a bit. "Three weeks ago, there were no chairs out here, and no people sitting out here. And the day after we put the chairs out, immediately, they started getting used," Sternlieb said. The group is planning on ordering more, but theft is still a concern. Securing the chairs to the ground isn't a great option, Sternlieb said, because they want people to be able to move them a few feet for a better view or to be more comfortable. As an example, he pointed to an office worker who'd moved chairs together along the canal to form a makeshift desk under the trees. "They're heavy enough so that it's inconvenient to just pick them up and take them... too far," Sternlieb said. Could someone have just pitched some of the chairs into the canal? He said it's a possibility -- but they won't know until the fall, when the canal is drained before cold weather. The chairs themselves are also trying to speak out against being swiped. "Take a selfie... please don't take the chair. If found in a suspicious area, call 202-298-9222," instructs a message on the chairs.